The Spotted Tongue: Backyard agility...with no yard! Well, I amend that. I have a yard. It's an approximately 10 foot by 10 foot patch of ratty grass full of pine cones, bushes, and one gigantic pine tree. On top of that, it's my front yard and mere feet from the road. The backyard is taken up with a large ramp and a garage that looks like it's falling apart. Ah, the beauty of living in a duplex in the city. 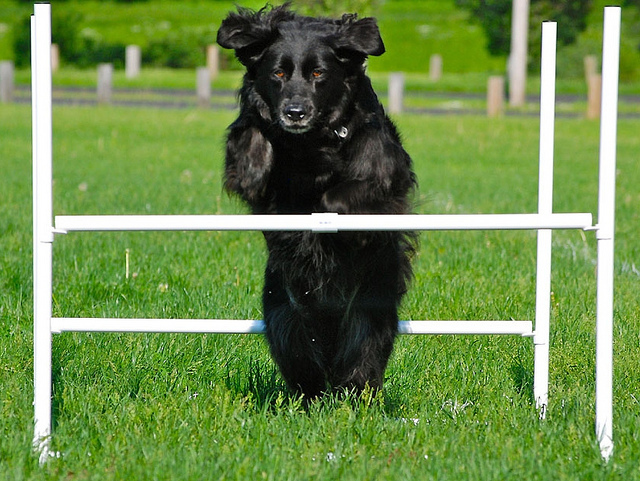 For someone like me, doing agility is a slow pain-staking process because practicing at home happens so rarely. 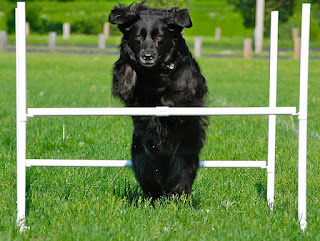 But here are some things I've done to practice backyard agility when I have no yard. Shortly after I started training in agility, I purchased a single jump from Affordable Agility. I would take that one jump and my dog down to a tiny corner of the park for training. This one jump enabled me to practice extension (setting her up far back from it and calling her to me over it or running with her to the jump and past) and collection (standing by the jump and calling her to it so she wraps tightly around it). Now that we're getting more advanced, I plan to use that one jump to practice sending her to it from further away. She needs to learn to get further away than the tips of my fingers! After that, I decided I needed more jumps. So I purchased a set of travel jumps. Now I had five jumps! This enabled me to set up basic jump grids. Having more than one jump also meant I could practice things we were really struggling with, like serpentines. And I could even set up small sequences. Please note this is very early on in our training! We had only just begun doing sequences when I set this little one up. We look much better now. What else can you do with just 5 jumps (or even just 4 jumps)? You can create simple box patterns to work on various elements. 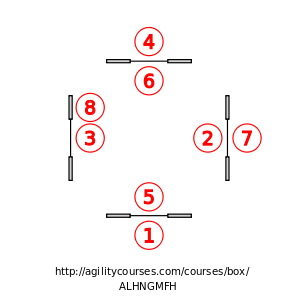 A box involves just 4 jumps, set up in a box pattern. This great website gives you a chance to let it design as many small courses as you want! For instance, if I wanted to work on 270's and wraps (and straights/90s), I could check those boxes off and come up with this as something to try. This website is a huge resource for those who want to create short courses at home, especially when you have a limited area to work in. All you need is 4 jumps (6 if you want to do a star box or 7 if you want to do a complete double box) and a little bit of space. 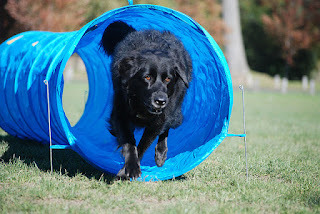 Dahlia and the super cheap eBay tunnel! In addition to the 5 jumps I own, I also bought a super cheap tunnel off eBay and a set of 6 stick-in-the-ground weave poles (which are sometimes more work than they're worth). The former has enabled me to work on Dahlia's tunnel hesitation. The latter has enabled me to work a bit on her 2x2 weaves. Where on earth do I set all this stuff up if not in my own ratty yard? I find a quiet corner of a park, bring Dahlia and everything down, and then set it up. It works fairly well, though it's certainly a bit of a chore (hence my not doing it too often and my not videotaping it when we do because that's just one more thing I need to set up!). It also tends to attract everyone and their brother to find out what this oddball woman is doing down there making her dog go over jumps and through tunnels and through those weird pole things that stick up out of the ground. Whenever I've gone down to the park and set up I've often become people's entertainment. In some ways this is good. If I had my own backyard, I wouldn't have so many distractions. But down in the park I have kids who are running around, people watching with their dogs at their sides, and a lot of people passing us by. It's been great for some distraction-proofing. Now if I could just get those people to run by waving hot dogs to really distraction-proof my dog! That would truly be a sight to behold, wouldn't it? Thank you! There's tons of awesome information from other folks writing today too. distraction training, that will stand you in good stead when you go to trials! Thank you Nancy! It definitely has been super helpful at trials. She's not distracted by the people milling around or the ring crew. Thankfully they can't have hot dogs sitting on their laps because I'm not so sure she'd be able to blow past that just yet. But she's getting there!